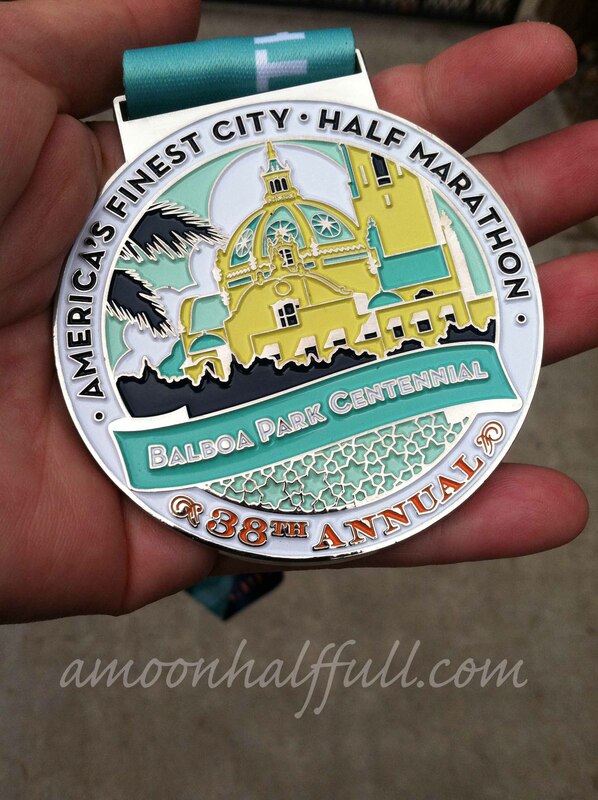 The final race in the Triple Crown series and the one I was dreading the most, the America’s Finest City Half Marathon. I am not a heat person. I don’t train well in the Summer. This race always takes place in August. Everything I had ever heard about this race is that they always run out of water and that it is hot. I started off my training in May gung-ho and looking forward to a PR. I wanted to train well and have a finish that rewarded my hard work. By the end of July my training had kind of fallen apart. The heat of the Summer was getting the best of me and I felt so defeated after every single one of my training runs. My excitement turned to dread as this race approached. 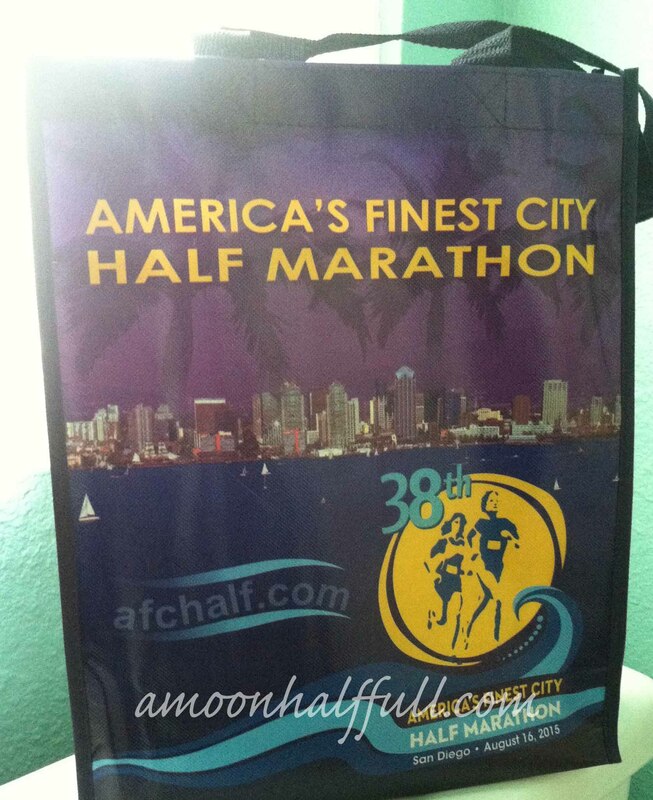 Packet pick up was at the Sheraton downtown, right adjacent to the airport. Parking was smooth but it was around noon and traffic on Harbor Drive was seriously terrible. The expo was pretty decent sized. It had a fair amount of vendors. I ended up buying some Nuun electrolyte tablets. I had never tried them before and they had samples available of all the flavors. Smart move, Nuun. Totally sold me. Triple Crown participants received a special bib. Every one received a technical shirt and a reusable shopping bag. I thought this was a great thing since every race I have done recently has given me one of those draw string back packs, which are also nice however, I was beginning to wonder what I would do with them all. It was refreshing to get something different that I could use in my everyday life. Weekend of the race we got a heat wave, of course. It was going to be hot and I was totally rattled. I was having extreme deja vu to my first race ever, the Disneyland Half in 2007 when the temperature the day of that race was 100 degrees and it was miserable. Saturday night, the night before the AFC, I received a heat advisory warning from the race directors. In the email they talked about potentially closing a portion of the course if the temperature hit 85 degrees before 8:30, eliminating 2 miles of the course. We would still get our medals in spite of the missing miles. They also said that if we were worried at all about the heat, we could use our half bibs to run in the 5K race and would still be awarded our half marathon and Triple Crown medals. I definitely wasn’t going to do that. It kind of defeated the purpose of doing the challenge if I didn’t actually complete it legitimately. This email, although informative, did nothing but make me more worried about the heat. Everything prepped and ready for race day. I went to bed at 10pm with my alarm set for 3am. I was unable to sleep all night which usually happens the night before a race, no sleep. I am always pleasantly surprised when I actually get some sleep the night before and it is amazing the difference it makes in my performance. I digress. 3am my alarm goes off, I get dressed and head down stairs to gather up my stuff and have some coffee. I was feeling hungry so I ate some Greek yogurt. I grabbed my PB&J, my electrolyte drink, and my packed up Camelbak and headed out the door at 3:45am. Heading into Balboa Park I experienced no traffic. I parked easily in the zoo parking lot and went to get on the buses. It was around 4:20am by now. The buses were scheduled to start transporting us at 4:30am. 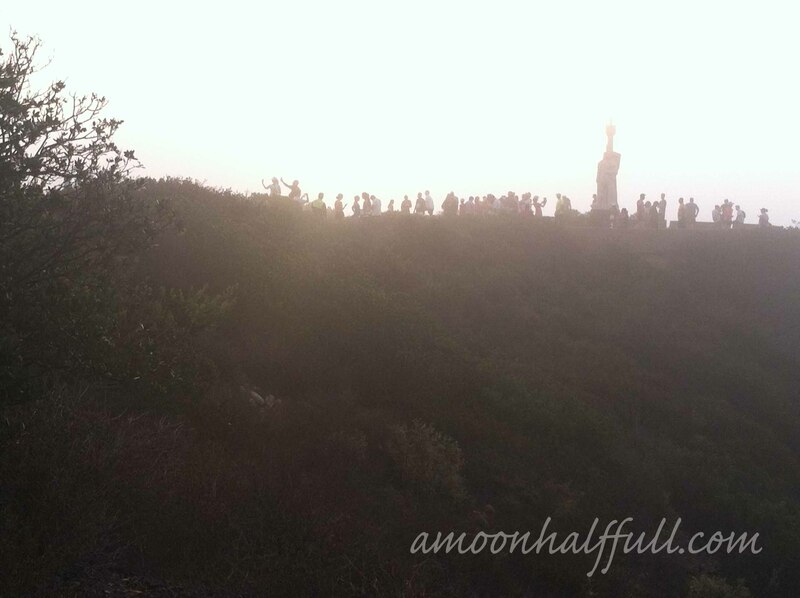 The bus drove us to Point Loma to the Cabrillo Monument. I am guessing we got there around 5:15am. It was dark and chilly. I didn’t bring a jacket or a trash bag to wear because it was going to be warm that day and all I could think about was how hot I was going to feel. 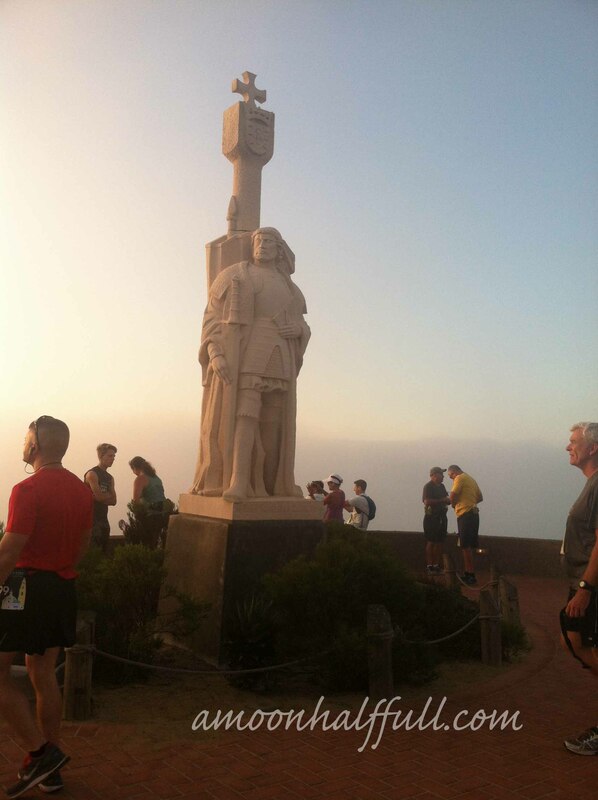 It was much warmer at my house and at Balboa Park than it was up at Cabrillo Monument. I wasn’t complaining and was just trying to absorb the chill to my bones to store up for later. It didn’t work BTW. Once the sun came up at about 6:15, it warmed up plenty fine. When the sun first came up, it was foggy. The views from the point were very obstructed. 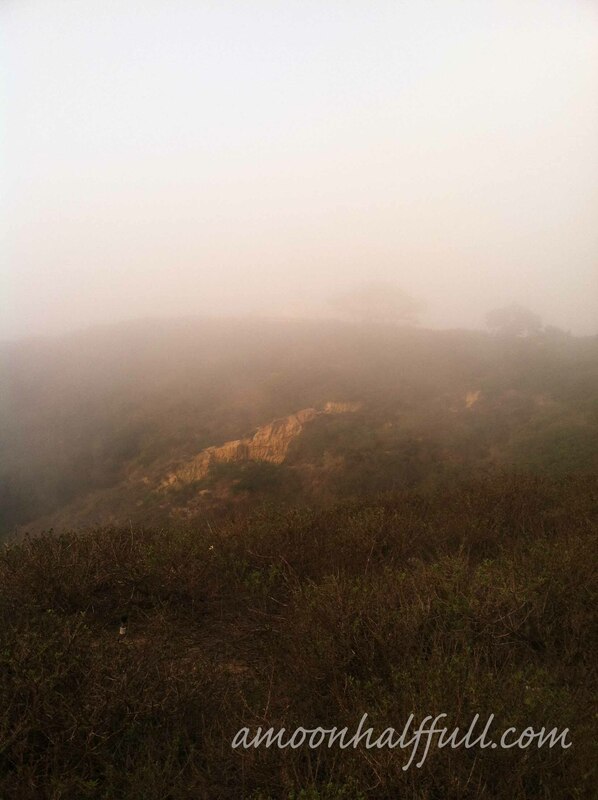 I could barely see the light house through the thick mist. I tried to get a picture of it obscured by the mist but I just couldn’t capture it.What a lovely place to hang out waiting for a race to start. I recommend using the ample time you have waiting for the race to start to explore this place. I don’t think I made the most of it because I was busy chatting it up with some fellow runners. I hadn’t been to Cabrillo Monument since I was in 4th grade and had gotten in trouble by the park ranger for “stealing” pennies out of the fountain. I might need to take a visit up there real soon. Before the race start, I hit the potties a couple of times and ate my PB&J sandwich and my banana and drank my Nuun. I felt good about my hydration. I was also wearing some new gear made with cooling tech fabric. 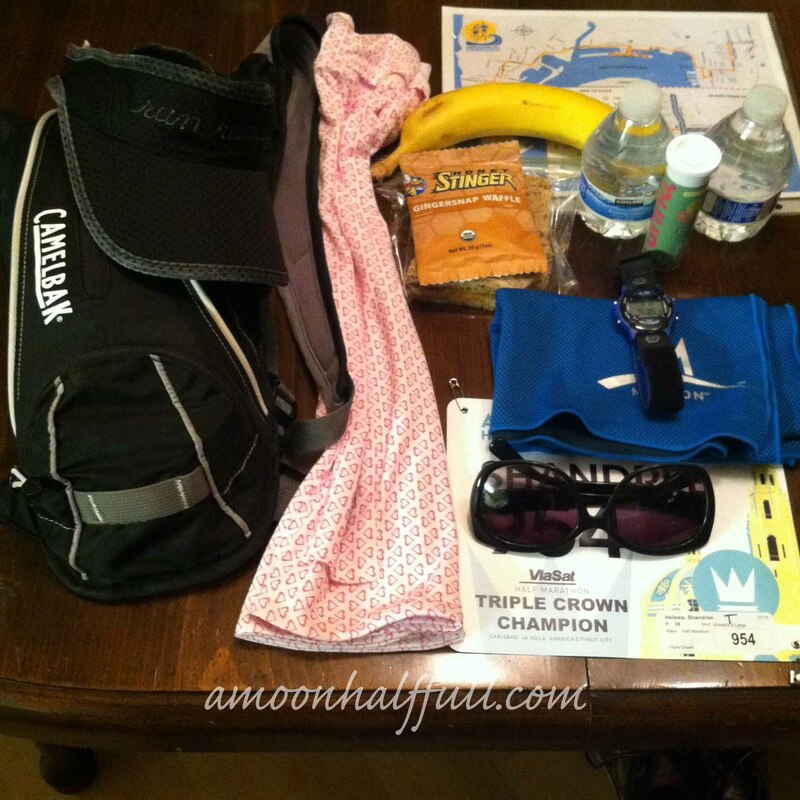 I had the Keep It Cool tank and arm sleeves from Runningskirts.com and a Endurosport cooling towel for my neck. The fabric cools when it is wet. During the actual race I really think these garments helped me tolerate the heat as best I could that day. I kept the arm sleeves constantly wet and poured water on my head at every water stop. It was hot and humid from the start of the race. I loved the beginning of the race when we were running through the Rosecrans National Cemetery. 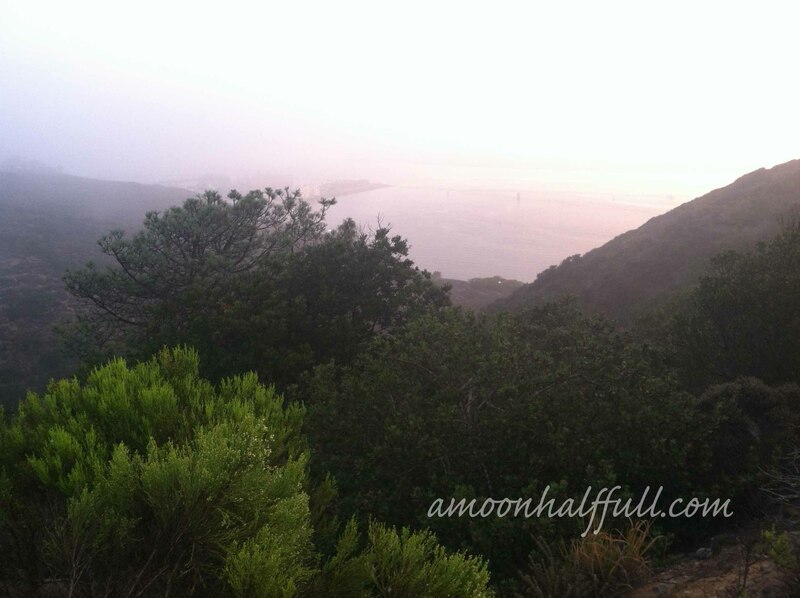 There was some lingering fog and seeing the marble head stones showing through the opaque mist was extra beautiful. I wish I could have gotten a picture of it but my phone was packed away at that point. I felt okay for the first 5 miles of the race. I was happy with my splits. By mile 6, I just kind of fell apart and couldn’t recover. I managed to make it to the cut off point in time a little after the 6 mile marker, but just barely. My pace progressively got slower. My Run/Walk intervals became very inconsistent. I was just so hot. People were collapsing all over the place. The race organizers were very wise to have the Race Guard first aid runners on the course. They were incredibly busy helping people during this race. By mile 9, I was down to a walk. I was getting more and more behind pace and knew that I wasn’t going to finish before the 3 hour time limit. I was feeling like I was going to get swept off the course at any time. I tried to pull it together to bust out some running but I just couldn’t get any consistent stretches. I’d do a minute and then stop to walk with the intention to start running again after a minute break but I just couldn’t do it. I was completely drained and just trying to survive. During mile 12 I saw a 7-11 and was tempted to pop in to buy a Slurpee but thought that was pushing the obnoxious level especially since I was behind pace. I just kept telling myself to keep moving. Finally I was at the Cabrillo Bridge. It was lined with American flags and they were already starting to pack them up. Thanks for the reminder that I was over time. Coming down the hill towards the finish line, we ran past the Organ Pavillion. They had someone playing music which was really a nice touch. I had read they were going to have someone playing that organ but was worried I had missed it since I was SO behind but I didn’t. As I came to the finish line, the announcer attempted to pronounce my name, First and Last. Kudos to you, Sir. This perked up my heart a bit. I have noticed that in the 5 previous races to this one, my name was never said even though the other runners coming in with me had their names said. I got the feeling no one wanted to even attempt to say it. Unique names problems. Once through the shoot I got my medal and my water and snacks. There was a finish area set up with various companies passing out samples. This is where I picked up my Triple Crown medal. I found a shady spot to rest and recover and stretch a bit before the long walk back to my car. Official time was 3:10 and some seconds. Not too bad. I had wanted to PR which means anything faster than 2:55 but it just wasn’t going to happen. Great course. 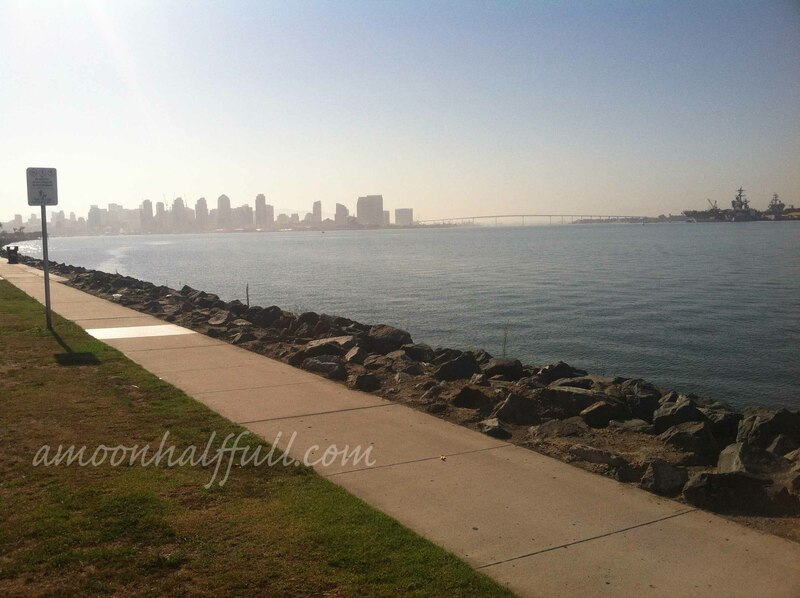 It hits many points of interest that are quintessentially San Diego. Have I mentioned how I love a point-to-point course?! The course was well supported. There was plenty of water on the course as well as electrolyte drink. Having the Race Guards on course was really wise and necessary. Beautiful medal. 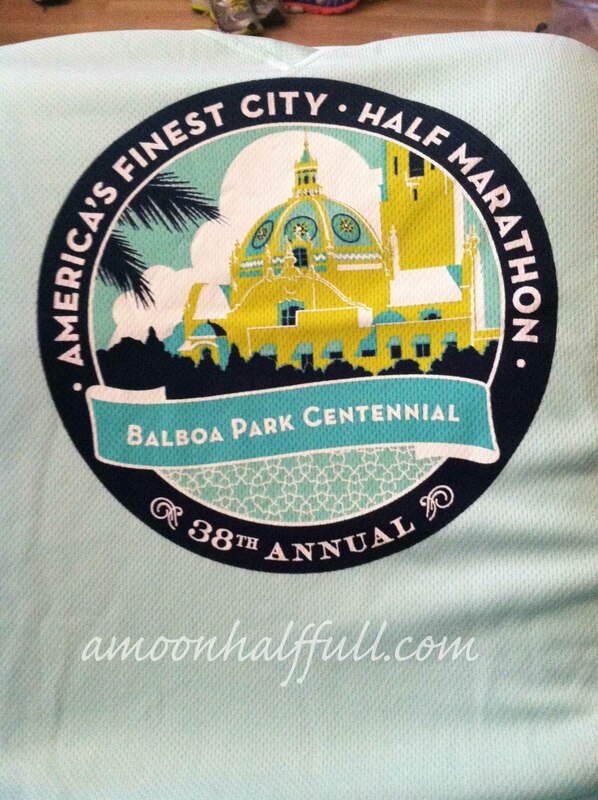 I loved the theme this year celebrating the centennial of Balboa Park. Parking was plentiful and easy. Plenty of potties at the start line and through out the race course. August race means heat and having to train in the heat. If it weren’t for that, I would consider making this race a regular thing.